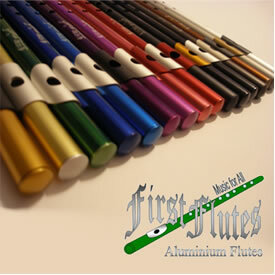 FirstFlutes manufactures a high quality range of flutes made in Anodised Aluminium. The Flutes are made to extremely tight tolerances using CNC machining technology which results in a perfect pitch over 2 ½ octaves. The current range of Flutes are in G, Ab, A, Bb, B, c and db. The c and G major flutes are available in a wide range of colours to suit your personality. The other flutes are only available in matt black and matt silver. The flutes have 2 additional holes or vents that assist in accurate octave tuning. All the flutes have a distinctive 2-tone mouth-piece which reduces the hissing sound whilst blowing. First Flutes are very easy for a novice to play a full octave with the addition of a thumb hole. This thumb hole is not available on the new stock of Bb and G Major. The product includes a perfectly in-tune Flute, a velvet bag, and instructions. There is a R70 premium over the matt black and matt silver flutes applied to the colourful flutes due to the costs of polishing, colour anodising and courier charges. The premium is well worth it to an individual customer as the colours are beautiful. Colours are not available to schools or marching bands if they want to benefit from the volume discount. Colours include: Light green, dark green, electric pink, pink, purple, Royal blue, light blue, red, yellow, gold, tan, brown, champagne, copper. Flutes are distributed via the internet only.